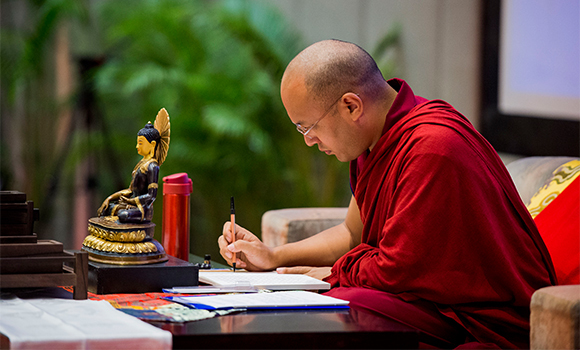 Following the advice of the Gyalwang Karmapa to practice the ten Dharma Activities, this evening everyone gathered again in the main hall to practice the first one: writing out the letters of the Dharma. On the tables in front of every cushion was an elegant, accordion-pleated book. It contained facsimiles of the Karmapa’s calligraphy in Chinese, including the Heart Sutra and the Praises of the Thirty-Five Buddhas. The texts had been screened so that the letters appeared in a soft shade of grey, giving a model to be copied over with the calligraphy pen set next to the book. For over an hour the hall was filled with the spacious melody of a classical stringed instrument and the feeling of intense concentration as one nun reminded people to write from their heart. 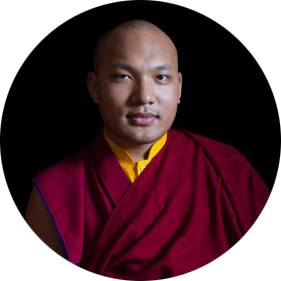 Part way through, the Karmapa entered the hall and walked down the main aisle, stopping now and then to look at people’s work. He took his seat on the stage and wrote out a copy of the sutra as well, giving a special blessing to the occasion.